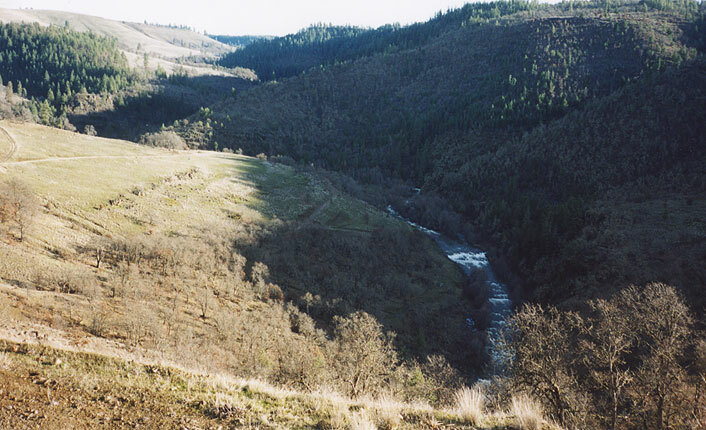 The Little Klickitat is a wonderful little creek that only runs during flood events. You're lucky if you can get on this creek once a year; in low water years this stream never runs at all. All of that aside, when the rains fall heavily this creek is a pleasure. It winds through a remote high desert canyon populated by a variety of wildlife; on our trip down we saw several bald eagles and a herd of deer. 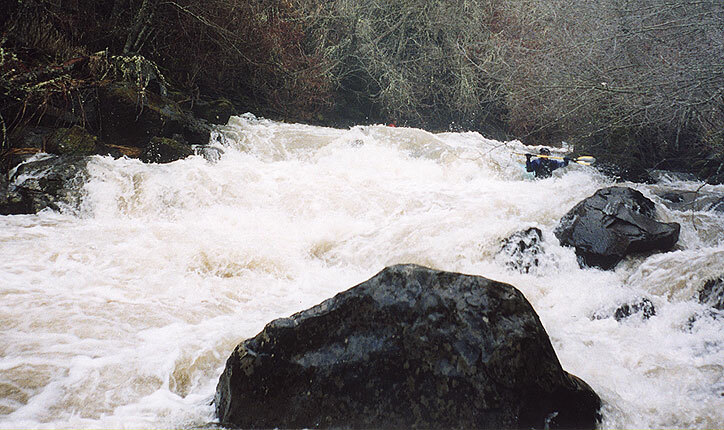 We ran the Little Klick during the flood of 2003. We were long overdue for a flood event, and everyone was a little bit giddy with the sudden surplus of water. 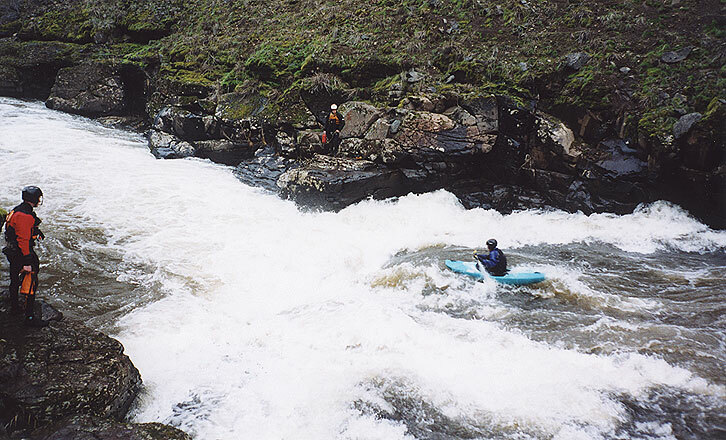 On the previous day Pete and I had paddled the June Creek section of the Clackamas at 10,000 cfs on the Three Lynx gauge, so we were definitely tuned up after a day of high-volume hole-bashing. The bottom end of the Little Klickitat Canyon, as viewed from the shuttle road; the canyon zig-zags up through the middle of the photo.
" Ahh, what a fine day to be boating... isn't that sun GREAT? It's almost like SPRING out here! Does anyone know what time it is?" 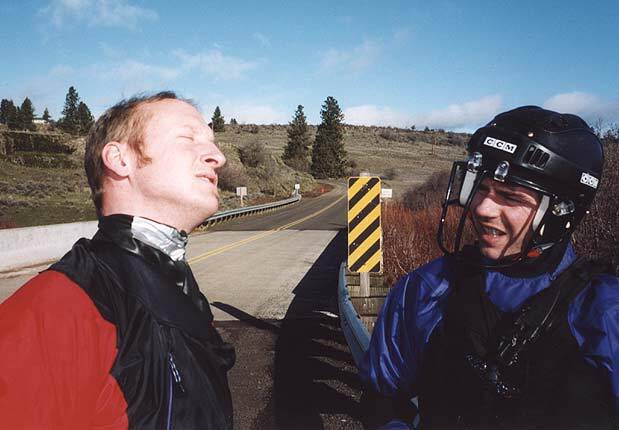 " I'd say it's time to get a new neck gasket..."
Eric Johnson (EJ),gets ready to put-in on the Little Klickitat. Access change: Do NOT use the Olsen Road Bridge as a put-in (the put-in described in the Bennett Guide) for this run. There are 'no trespassing' signs posted there now. There is an alternate access bridge a half mile upstream, see the end of this report for details. 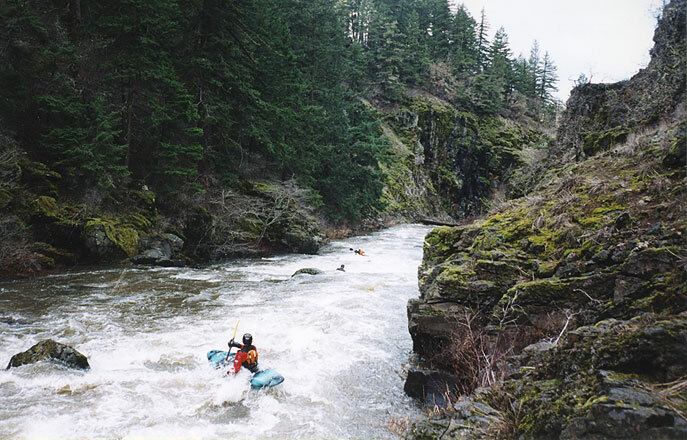 Below the put-in the Little Klickitat is narrow, fast, and brushy as you approach the canyon. 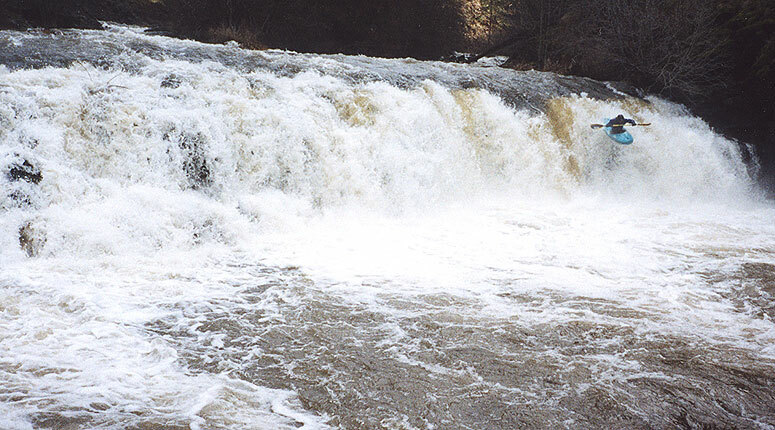 There are no major rapids in the first quarter mile or so, but soon enough the creek bends sharply to the right and drops out of sight, signaling the first major drop, which is also the only recommended portage. 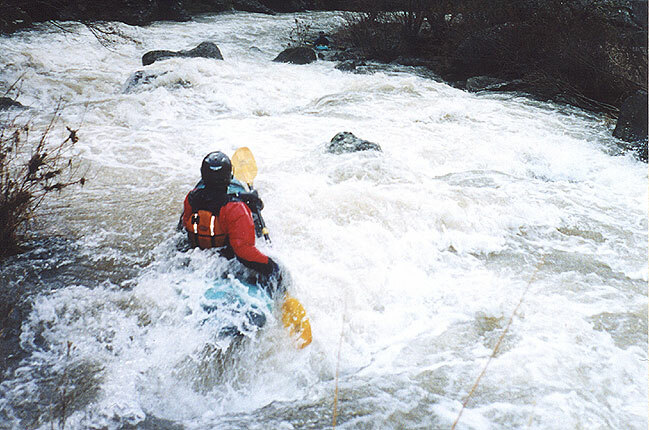 This first drop contains a dangerous, hidden crack somewhere in the center of the rapid that has trapped a couple of paddlers in the past. At this flow it may have been filled in, and we later found out that it is runnable down the far left or right. However, we didn't know that for sure at the time, so a portage seemed to be the wisest option. Immediately downstream the gradient kicked off and the creek started to roll though one steep boulder garden after another. The drops started fairly easy and gradually built in intensity..
Eric charges down one of the first sizable rapids while Pete watches from the pool below on river-right.. 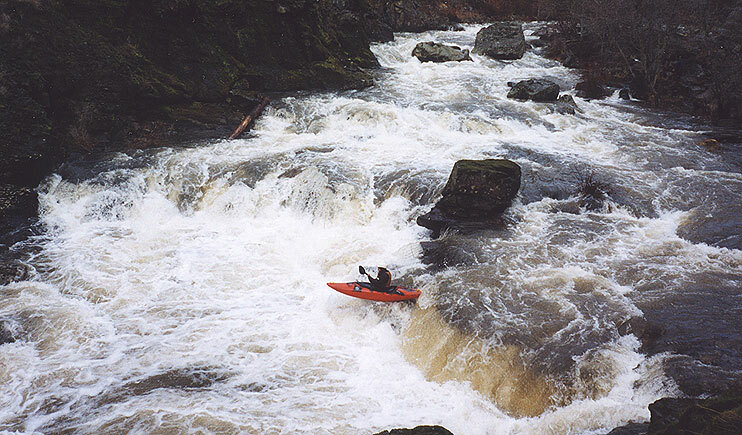 The creek never really gorges up, but you can definitely get stuck if you boat-scout too aggressively at this flow. As we approached the rapid pictured below I got into an eddy on river right above the main part of the drop and couldn't see what was downstream; I was forced to do an exceedingly difficult ferry to get over on the river-left side so I could scout this long rapid, and I almost missed the eddy and ended up running it blind. This was a little bit nerve-wracking, because I could see the large undercut boulder on the left and wasn't quite sure what was below that..
Just downstream is a ledge noted in the guidebook for the power of it's hydraulic. Since we were on the creek well above recommended flows we stopped well upstream, but after studying the hole for awhile Pete decided it would go. He went first, lining up on the thin tongue of water slicing through the meat of the hole on the right, and melted through into the pool below. I followed, with much the same result..
Chad and Eric stand by with ropes as Pete charges downriver into the largest hydraulic on the creek, a beefy, uniform hole at the bottom of a long slide. Downstream of the slide Pete and Eric were aggressively boat-scouting when they got stuck at the lip of a steep drop. Chad and I managed to get out and scout the rapid on river-left, and after decrypting my hand signals from downstream Pete probed the drop, which turned out to be a very fun S-turn around some stomping holes..
Pete and Eric ran this one blind when they boat-scouted to point where they could not get out and scout. 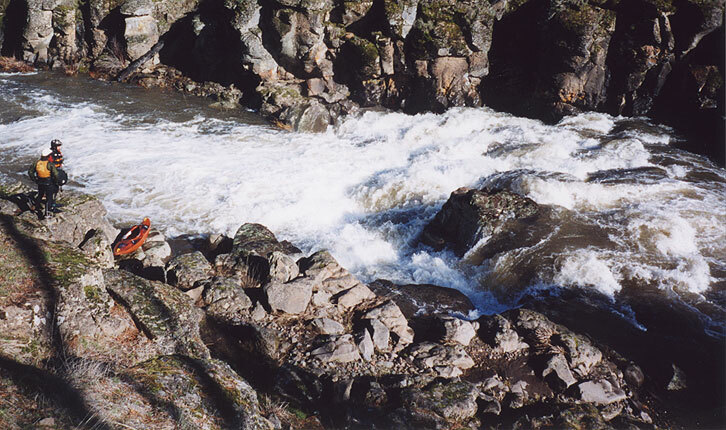 If you look carefully you can see Eric up in the eddy halfway down the rapid in the center of the photo, waiting his turn..
Downstream were more fun rapids as we approached Little Klickitat Falls. There is a rapid leading pretty much right to the lip of the falls, so first-timers should exercise caution above this drop. I don't run many waterfalls these days since the my accident on the Little White, so I portaged on the right. The portage route involved a little scrambling on loose scree, but it wasn't too difficult. 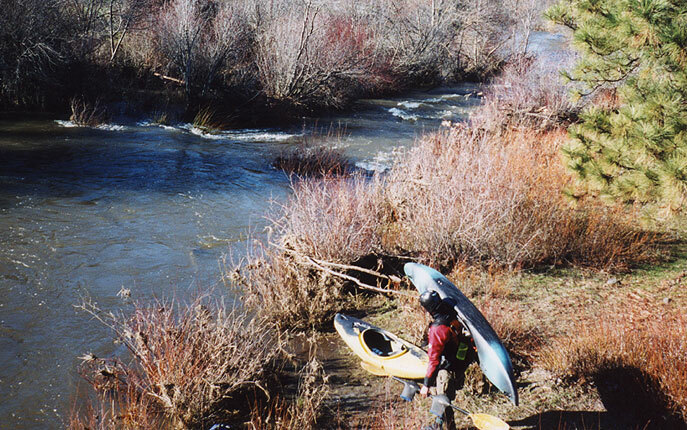 The Falls is rumored to have a few shallow spots in the middle, but Pete and Eric had no problems on the left side. Pete actually hiked back up to run the falls twice, getting a nice boof onto the aerated pile on his second lap over..
Chad, Pete, and Eric cruise downstream below the Falls. Below the falls the rapids mellow out, and you have about three miles of class II-III before the take out. This is the stretch that would be absolutely miserable at low flows, but with a healthy flow there were a ton of great surf waves and holes to goof around in. Pete stands above the bridge piling we used as a gauge. ACCESS: Do NOT use the put-in described in the Bennett Guide for this run. There are no-trespassing signs at that location now. There is an alternate put-in a half mile upstream. - Follow Bennett guide directions to published put-in on Olson Rd. - Continue on 142 past Olson Rd approx. 1 mile. In this mile the road will go straight, and then bend hard right (South). After you start heading South the road will take a hard left (East). At this bend, go straight down onto the dirt road. Follow this until you are just short of the bridge over the L.Klick. The parking area is down just right (downstream) of the bridge, indicated by the 'P' on the map shown below. 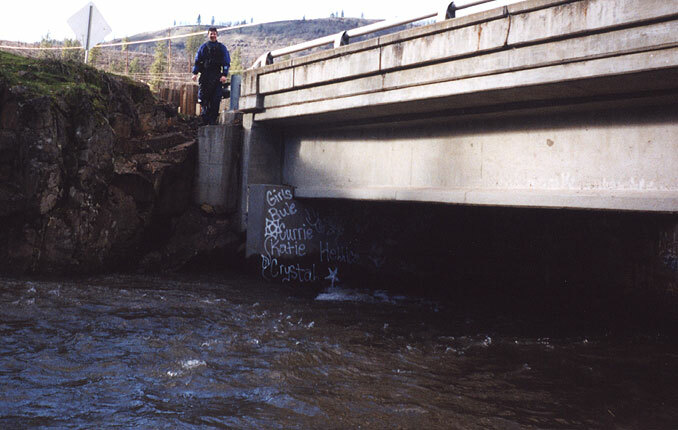 FLOWS: This creek only runs during high water events.